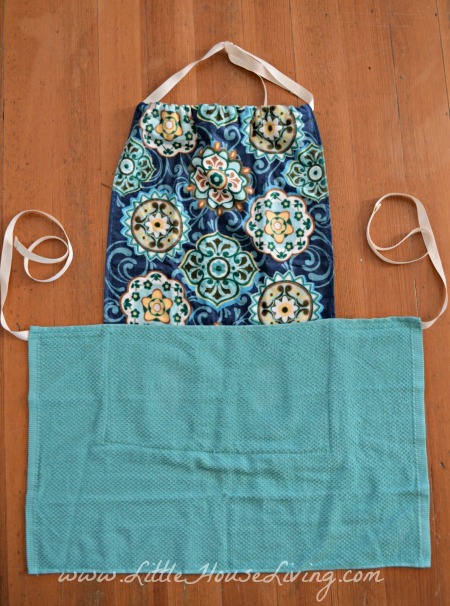 This little Dish Towel Apron is a fun project to try if you need a new apron for yourself, or if you are looking to make a cute and inexpensive handmade gift for the upcoming holiday season. 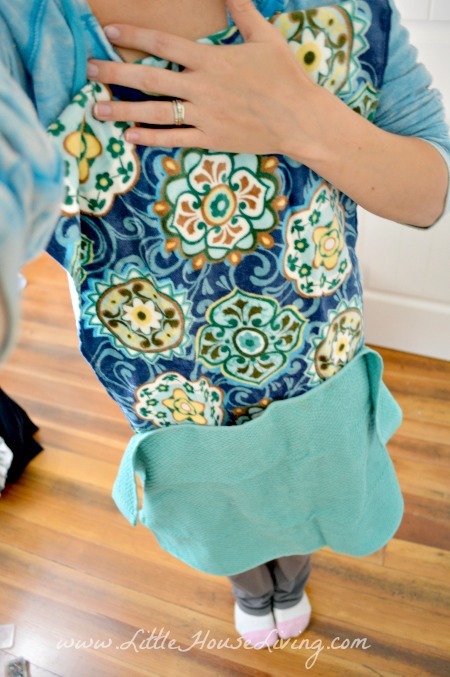 This apron only takes about 15 minutes, start to finish, to make so it can be made up very quickly and it’s very easy to make. 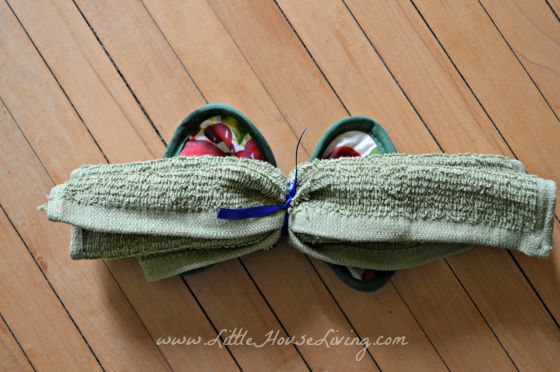 So if you are a beginner sewer, or you have a budding seamstress in your house, this would be a good project for them. 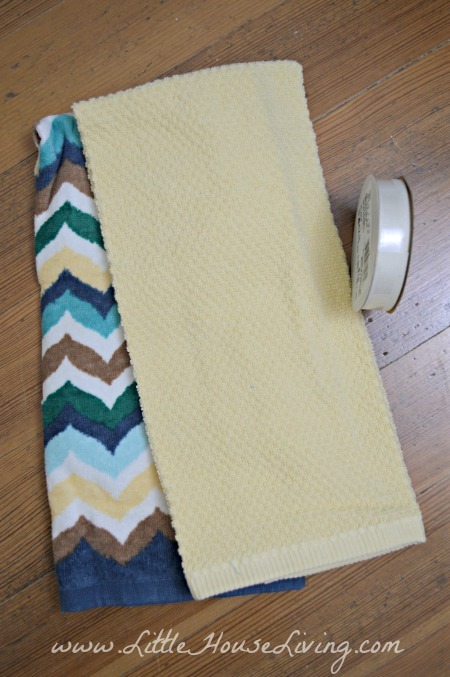 Start by taking your 2 towels and laying them like this, front side to the floor. 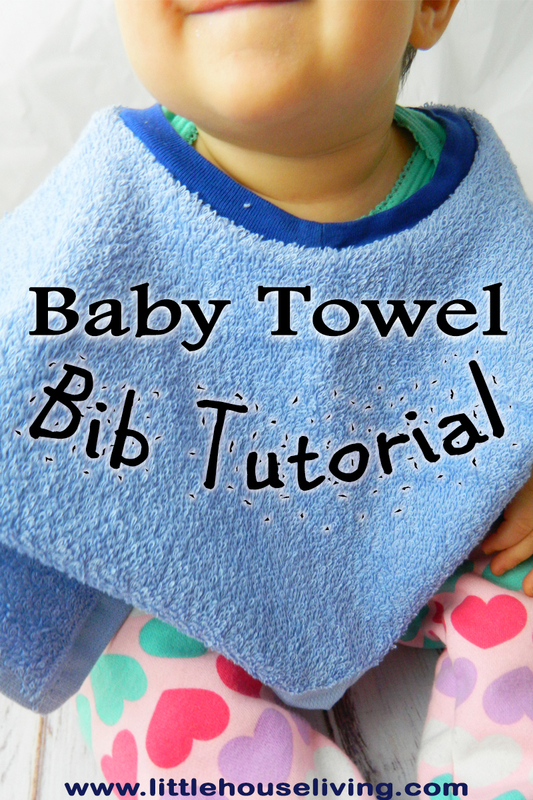 Place the top towel vertically about 3/4 of the way down the other towel which should be horizontal. Pin the towels together like this. Just for reference, here’s what the apron should like like in the front at this point. If you are making the apron for yourself, now is a good time to measure and make sure you have the size right. Hold the top of the apron up to your chest slightly further than it will actually sit (you will fold over about an inch of the top). The bottom towel should be sitting right at your hips, if it doesn’t you will need to adjust. If you are making the apron for someone else you will have to make an educated guess on the size. As I mentioned above, I placed the top towel 3/4 of the way onto the second towel. I’m almost 5’5″ and have a long torso. Start sewing! 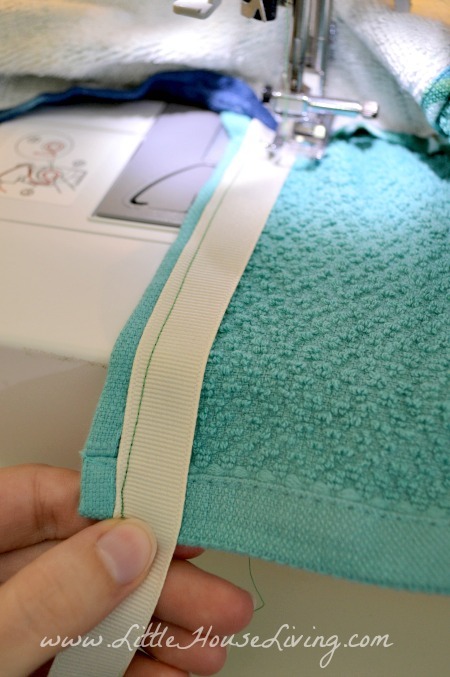 Sew around the edge of the towel where you pinned so that the 2 towels are sewn together. 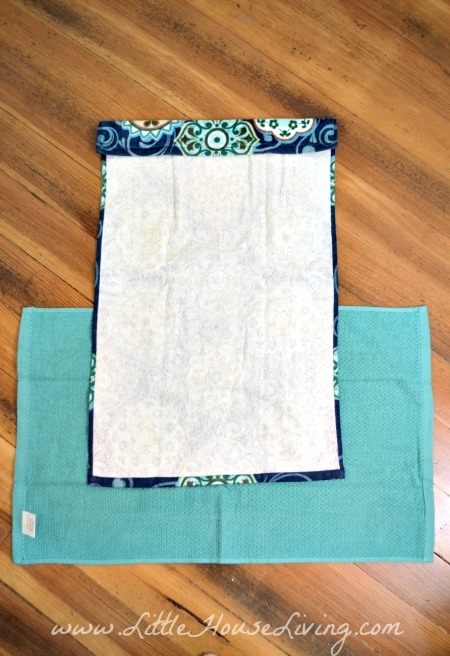 Only sew on 3 sides of the towel, not across the top where the 2 towels meet so you will create a large pocket. 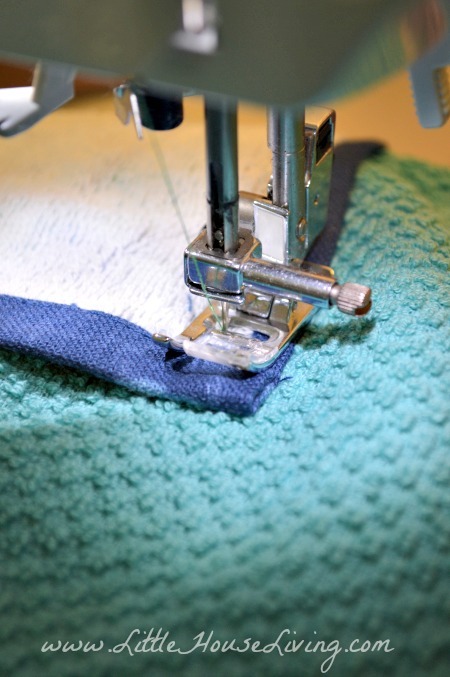 If you want 2 pockets you can sew another line of stitches up the middle of the pocket to separate it into 2. I leave mine with one large pocket. Sew the hem on the top of the apron next. Fold over about an inch of the towel (depending on how large your ribbon is). 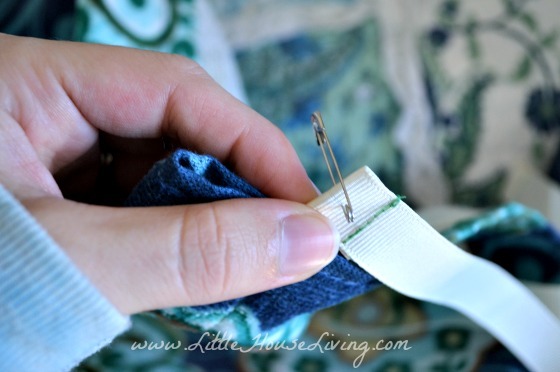 Sew near the actual hem of the towel to form a little tube in the fabric that you will be able to pull the ribbon through. Cut 3 lengths of the ribbon, 36 inches long each. Sew 2 of the ribbons onto the bottom towel, right where the two towels meet, to create the tie back for your waist. 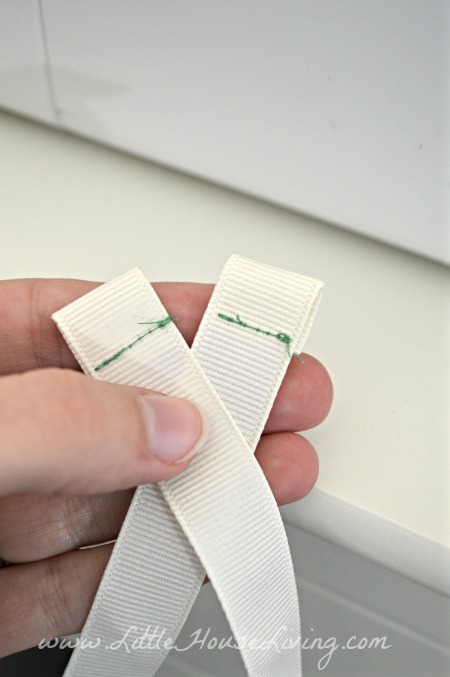 To make sure your ribbon doesn’t fray, fold over the ends and sew. Do this on both the waist ribbons and the 3rd ribbon that will go around the neck. Take the 3rd ribbon and use a safety pin to help you thread the ribbon through the tube in the top of the apron to create a gathered neckline. That’s it! 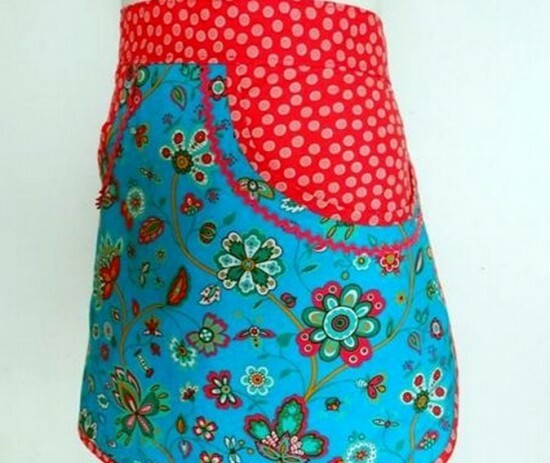 This is such a cute little apron and I love that they can be made with any kitchen towels, I like the ones that are a little more absorbent because I’m quite the mess maker in the kitchen. What do you think? 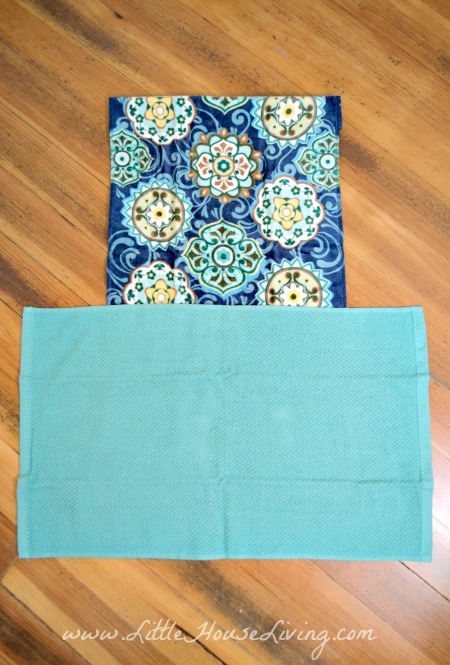 Will you make this Dish Towel Apron? Will you make it for yourself or someone else? This is a really clever idea! My daughter’s 10 yr. old son wants to sew a gift for his mom..this will be it! I always love your posts,Merissa..Happy Thanksgiving to you and your family!! Great idea! I never would have thought of this! Well that’s freaking genius! They have such cute towels these days, and it would be absorbent. Now I need to go to town. 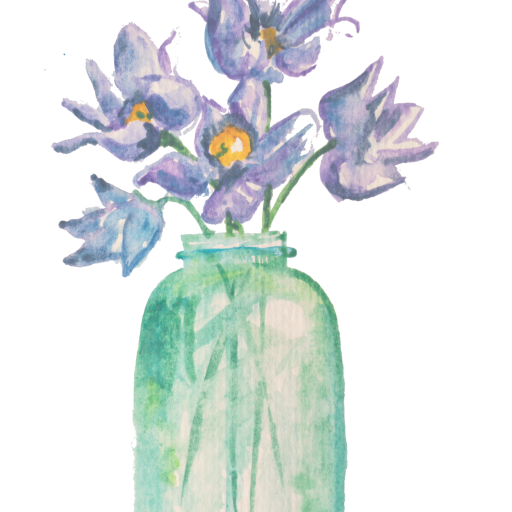 One of my goals is to buy a sewing machine and tackle some sewing projects, simple ones. I hope this isn’t a duplicate..I posted this am. I said that this is a clever idea and that my 10 yr.old grandson wants to sew his mom a Christmas gift. This will be perfect! I love your posts,Merissa!! Happy Thanksgiving to you and your family!! Sooooo cute! They have some adorable red and purple dish towels at Sam’s Club in a 12 pack right now. 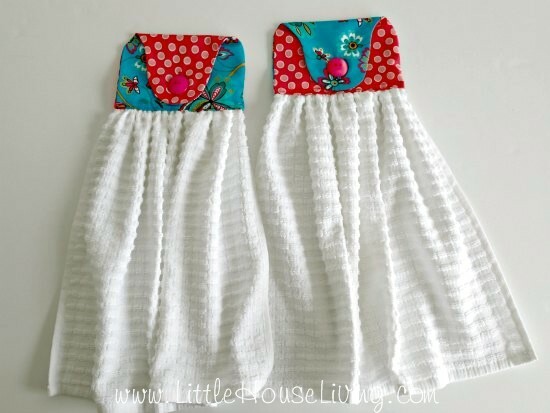 I think I will get a pack when I go again to make aprons for my girls and I for Christmas cooking! Thank you for sharing! This is a great idea because I am always wiping my hands on a tea towel and this would be right where I need it. Thanks for this! this is beautiful! What a great idea! I love it and I will be making some! What a darling and easy idea! When I first saw the picture I thought “there is no way a dish towel would fit around this bod!” but adding ribbon makes it one size fits all! Genius! Thanks for sharing. I found you on Project Parade. So glad I did! 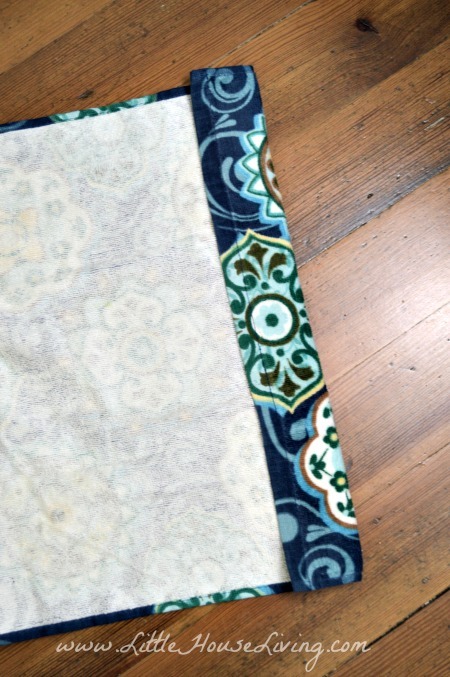 Love a quick and easy project! I need to do this because I don’t have an apron and like that this one has a pocket. Featuring you tomorrow at Show Me Saturday! Hope to see you there. I bought Christmas towels and green ribbon today to make a Christmas apron! This is genius and I think I’m going to get a lot of use out of this pattern! 🙂 Also pinned it! I love this. Making for my self and two adult daughters, all of us mess makers. Thanks. Thank you so much! My son wanted a “real” cooking set his size for Christmas, he’s 8. I wanted to add an apron, but couldn’t find a decent, reasonably priced one. This pattern is excellent! I bought 2 towels at the dollar store and already had some ribbon. Then I used rainbow yarn to stitch it together by hand, whip stitch around the whole thing and stitch his initials on the top. I love it, I hope he does too. thanks for sharing this idea with us. I sewed up 3 of them this evening and it took me less than 45 minutes, just like you said. I haven’t added anything to the towels, just sewed them together. Easy, practical and not expensive at all. Mariane. super cool! now I need to do some towel shopping! thanks for the tute!